The video – the fifth chapter of the seven-part film – hones in on the end of a young couple’s relationship in the American Southwest while revealing the pair’s past as ex-lovers who were like a tattooed Bonnie & Clyde, holding up bars and committing crimes before their split. “’If Love Is The Law’ doubles as both a standalone music video for the track as well as trailer for Stranded On The Earth; the film will feature ‘a chronological story line about two outlaws who meet and fall in love,’” Bruce tells Rolling Stone. “As a whole the videos will eventually be released as a film entitled Stranded On The Earth complete with dialog sequences and live performances. 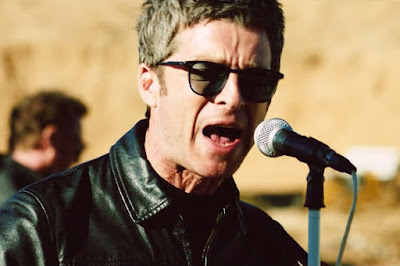 The fourth single from Gallagher’s current album, "If Love Is The Law" features a guest performance from Johnny Marr on guitar and harmonica and will be released on black 12” vinyl and a limited edition 12" vinyl picture disc on September 21; the project includes album and instrumental versions of the song alongside “Alone On The Rope”, a tune previously issued as a bonus track on the Amazon MP3 Deluxe Version of the group’s 2011self-titled debut. Produced by David Holmes, “Who Built The Moon?” earned Gallagher his third consecutive UK No. 1 record upon its release last fall.